Spoiler Warning: This review contains spoilers for Episode 1 of Life Is Strange 2 and The Awesome Adventures of Captain Spirit. Life Is Strange 2's second episode slows things down. Way down. Where Episode 1 set the scene of two brothers going on the lam, Episode 2 sees them getting complacent in their situation. They're dirty and hungry, but they're used to it. Sean even knows how to boil water now to sterilize it to keep them from getting sick. They're basically outlaw-pros now. Episode 2: "Rules" picks up sometime after we saw Daniel and Sean on a bus, heading south towards Mexico. They've been squatting in a vacant cabin in the snowy wilderness with their new puppy Mushroom. It's cold, but the boys ignore the coat from the cabin's previous owner for some reason. They get by on a large supply of canned ravioli. The choice-driven episodic adventure plays the same as the first episode, but now it has a twist. Now that Daniel's cognizant of his powers, Sean's helping his younger brother learn how to control it. Whereas in the last episode a special blue outlined prompt signified talking about something with Daniel, in Episode 2 it's more encompassing. Sometimes with the prompt, Daniel's powers will interact with things too, like opening a locked door. Sean's already made astounding progress with his powers in the short time from the first episode, lifting rocks and snowballs using his mind with hardly an issue. The two brothers eventually set off in a new direction early on in Episode 2: towards their grandparents' house in the small town of Beaver Creek, Oregon. It's a risky endeavor, because they hardly know their grandparents. The last time Sean saw them was before Daniel was even born—as they're from their mother's side, who abandoned them when they were young. As it turns out, their grandparents don't have a great relationship with their daughter either. While there is some tension and strict rules, the reunited family bonds over breakfasts, model train sets, and even awkward praying. It's a nice change of pace for the episode, staying relatively put in one place, because the last one was almost always on the move. I even found myself getting comfortable navigating the grandparents' two-story home; from tidying up loose things like toys and boxes of cereal to help out wherever possible, to catching up with the grandparents who were basically strangers. Episode 2 is also where the special standalone episode released in the summer of 2018, The Awesome Adventures of Captain Spirit, comes into play. Sean and Daniel's grandparents live right next door to the star of the prequel-spinoff. The kid, named Chris, gets introduced at where we last saw him in The Awesome Adventures of Captain Spirit: when he fell off his treehouse, and somehow survived the fall thanks to levitating for a moment. Back then we had no clue how it happened, and only got a glimpse of Daniel and Sean in the aftermath before we even knew they would be the stars of Life Is Strange 2. Sean and Chris become fast friends. 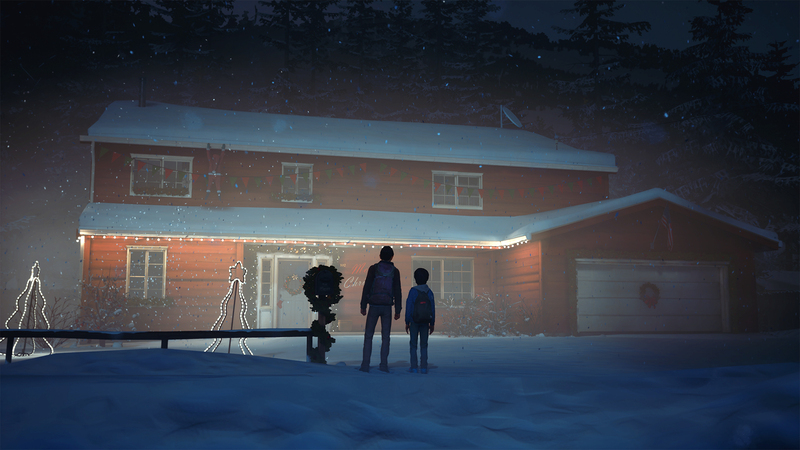 Life Is Strange 2 is still at its best in its careful character molding of the two brothers. I've shaped Sean to maybe be a bit too controlling. I scold Daniel when he swears, wanting for him to have some parental structure in his life, and urge him to keep his powers a secret. Judging from some consequences I saw in Episode 2, Daniel might eventually resent me for it—even if it keeps him safer. Players can take the opposite approach too, letting him use his powers whenever he wishes with no restraint, and so on. From a polish standpoint, Episode 2 is a lot buggier than I remember the prior episode being. Textures often take a long while to load in, and sometimes backgrounds flash a bright light before settling. The sometimes-stilted animations have always been present in the Life Is Strange series, but in Episode 2, it's even more noticeable. Episode 2 may not be an attention-arresting adventure like the first episode was, but it takes risks in slowing down its pace and throwing more plot intrigue into the mix. I'm still invested in Sean and Daniel's journey, especially now that Daniel's supernatural powers are more of a focus. Even if Episode 2 isn't as endearing and exciting as Episode 1, it still has me looking forward to whatever the Diaz brothers get into next. Tagged with Adventure,	DONTNOD Entertainment,	Macs,	PC,	PlayStation 4,	Reviews,	Square Enix,	Xbox One.